1637 ~ Ann Hutchinson, age 37, was tried before a Boston church and excommunicated for “traducing” (=slandering) the ministers for not allowing women’s voices to be heard after she dared to have “tea” with the ladies on Tuesday to “discuss” the Sunday sermon. Mary Dyer was hung on the Boston Commons for supporting her close friend, Ann Hutchinson. 1775 ~ Deborah Champion, dressed in disguise, delivers a message to George Washington in Boston, and continues to serve during the Revolutionary War. 1790 ~ Sarah Pierce responds to women’s desire for “academic subjects” (beyond skills taught for leisured domestic life, such as etiquette, homemaking, & fancy needlework) by opening the Litchfield Female Academy. 1810 ~ Establishment, in Farmington, CT, on September 5th, of the American Board of Commissioners of Foreign Missions as a result of the petition by four of the “Haystack” five theology students’ missionary zeal for foreign lands to the General Association of Congregational Ministers of Massachusetts. The first eight missionaries were commissioned and sent to Calcutta, India in 1812. 1824 ~ Catherine Beecher opened Hartford Female Seminary to train girls to become teachers. 1833 ~ Prudence Crandall opens a school for ladies studies in Canterbury, CT, admitting one black child, which caused a tempest and the withdrawal of all whites. She replaced them with blacks, for which the town fathers brought her to trial, thus, “shaming” her. Her well was polluted and her house destroyed by a mob, causing her to close the school and flee west. Canterbury eventually became a center for anti-slavery advocates. 1853 ~ New York, ordination of Antoinette Brown, September 15th. 1867 ~ Ohio, ordination of Melissa Timmons (later Tarill), March 7th. 1867 ~ Women’s Board of Missions formed in Boston to collect funds for native women to learn to be Bible readers. Their philosophy was to “train the natives (in India), resign and turn the work over to them.” ~ a novel idea! was credited as an instrumental force in freeing the slaves, and about whom Abraham Lincoln was heard to ask:” Is that the little lady who started the big war?” Indeed, as rumors of civil war circulated, women began to organize and speak out (and men began to listen!). 1875-79 ~Women’s Societies began to knit and sew to support the needs of soldiers during the Civil War, and worked in the stench of the hospitals nursing and caring for the sick and wounded sons and fathers. 1889 ~ only four female Congregational ministers listed in Congregational yearbook. By 1899, # 49 females; 1910, # 89; 1920, # 109. Worth noting: the first Hawaiian female was ordained in 1925: “Mother Alice” Rosechill Kahokuoluna was the first woman of Hawaiian descent and therefore the first woman in the Pacific Islander and Asian American (PAAM) community to be ordained to ministry. 1926 ~ After several years of study and conferences, the American Board of Commissioners for Foreign Missions (ABCFM), founded in 1810, and the Women’s Board of Missions (WBM), founded in 1868, effected a merger (12/31/26), resulting in ABCFM becoming the one Congregational Board for missionary work. Amy Ogden Welcher is recording secretary for the Council and becomes its first President. She commented that “Whites were not allowed (by the men) to go into black churches.” They pledged to continue the work of the four “Districts” across the state. 1941 -1945 ~ During and just after WW II, women’s groups focused on having local speakers from the area to conserve on tires. Board members were defense workers and not as available, and women were busy making bandages for the Red Cross. 1951 ~#4 Joanna W. Stroeker was ordained. 1956 ~ Discussion began on Women’s Fellowship having an office secretary. 1957 ~ Evangelical & Reformed Church and the Congregational Christian Churches formed the United Church of Christ. 1963 ~ Helen Huntington Smith became the executive of CLLW, thus becoming the first lay person and first woman to head a national instrumentality in the UCC. 1964 ~ Annual meeting of the CT Conference changes its name to The United Church of Christ, September 23rd, with the Women’s Fellowship voting to change its name to The Women’s Fellowship of the CT Conference of the United Church of Christ on October 6th. It would vote to change again in 1997 to CT Women of the United Church of Christ (CT Conference of Congregational Christian Churches). The creation of a Task Force on Women in Church on Society (TFWCS) associated with that action led to the publishing of COMMON LOT in 1972, and in 1973, to establishment of the Antoinette Brown Award, to honor two outstanding ordained women at each General Synod. Louise Wallace , a lay woman active in the Kansas Oklahoma Conference and deeply involved with Church Women United, was Co-chair of the TFWCS, had the idea for the Antoinette Brown Award and designed the medallion given to recipients. The resultant transformation to becoming The Coordinating Center for Women that took place from 1971 to 1987 dramatically changed the place and leadership of women in the UCC. 1972 ~ First Hispanic woman ordained: Candita Bauza-Mattos, Nov. 10th. 1974 ~ First African American woman ordained: Yvonne Delk, in Virginia, first to head a national instrumentality (the Office for Church in Society) in the UCC. 1979 ~ Marilyn Breitling, first executive for the newly formed Coordinating Center for Women, continuing in that position until 1991. 1987 ~ CT women engage in the activism of the California “Grape Boycott” as well as the Nestle and American Home products buying boycotts. 1998 ~ Women were taking a real part in church and society in leadership positions as The Missionary Society of CT marked 200 years (1798-1998) and celebrated the 189th Annual Meeting of the United Church Board of World Ministries and extended “the right hand of fellowship” to the members of the Christian Church (Disciples of Christ), by hosting the meeting AND presenting the play “To Catch the Connecting Cord,” a history of CT Women, 1928-1998, written by Betsy Work. The Huguenot Cross became a symbol of service for Board members, with the President receiving an enameled, gold colored one. 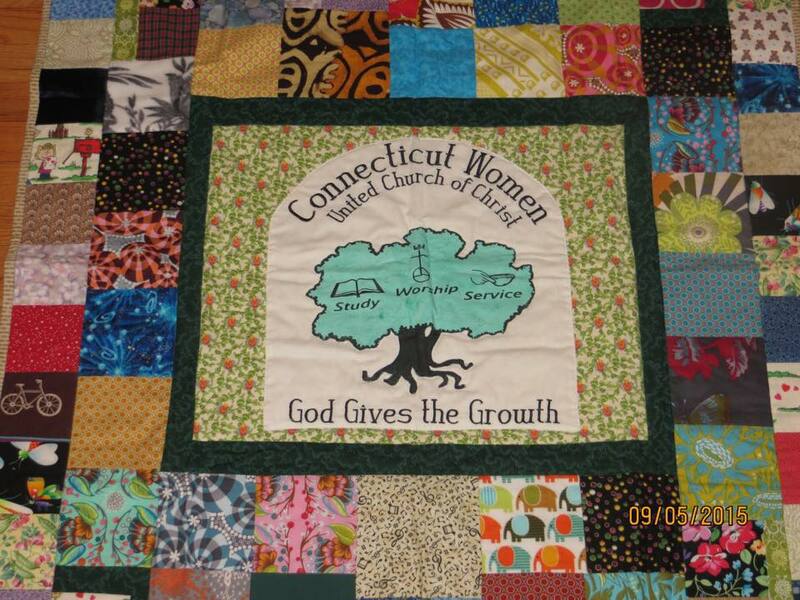 2001 ~ At the suggestion of Loralee Huston, CTWUCC begin the practice of honoring lay women in CT’s local UCC churches (nominated by their church) with a Service of Recognition at each Annual Gathering. In addition to a certificate, awardees are given corsages, a group photo taken, biographical information is printed in materials for the day, and they are luncheon guests (sponsored by their church). 2001-2003 ~ $ 10,000 for a cabin at CT Conference’s “Silver Lake “ camp for youth and adults ($ 12,000 was actually received by April, 2003). The “cabin” money was actually later used for renovation of the central meeting space with new Dean’s spaces. 2004-2006 ~ $ 15,000 for Wanga Elementary School in Nairobi, Kenya, serving 1,976 students. 2008-2010~ $ 16,350.16 received (exceeding the goal of $ 15,000 goal) for CWS Project HOPE to enable children orphaned by HIV/AIDS in several African countries to become self sufficient families. 2009 – 2011 ~ Silver Lake “cabin funds re-allocated to completing Commons building and new goal of $ 15,000 set to refurbish the Retreat Lodge ($ 3,447 received as of February 28, 2010. 2012 -2013 ~ $ 12,903.30 for ROMA children’s project (through Church World Service) in Serbia. inviting all women to an annual Day Apart. encourage participation in Church Women United.